2013 sounds like such a funny, futuristic date to me. I’m sure we will be used to it soon enough. I first heard of this year back in 1983 when DH and I took out a thirty year mortgage to buy our first house. The pay-off date sounded like such a ridiculous, sci-fi kind of thing, in the next century, for heaven’s sake. Of course, we long ago paid off that mortgage, and bought this place, and paid it off, too, so 2013 no longer holds any real estate significance to us. We shall have to see what the year brings. For quilting motivation in 2013, I am going to try Judy’s “Getting It Done”. This involves listing quilty goals for the coming month, and they can include new projects or portions of them, as well as UFOs. (Tanesha at Crafty Garden Mom is doing a UFO Along that sounds fun. I have very few quilt UFOs , but I might join in later if I ever pick up my knitting needles again.) On the one hand, I don’t want to be overly focused on productivity, but I also know that I tend to get nothing done if I don’t set goals, so I think I will try this. 1. Construct Quilt of Valor top during New Year’s Day Sit and Sew (also #NDSI on Twitter). 2. Quilt/finish said QOV quilt. 4. Create a fun, new quilt of my choice using stash fabric, inspired by playing with said fabric. I feel like my 100 yd destashing goal of last year worked out really well, so I’m going with 100 more yards for this year. It’s a significant amount, but not so high that it won’t permit me to buy some new fabric when I want to. Thank you to the readers who assured me that I am allowed to buy fabric, since I’ve been so good, and that quilting is about having fun. I know, and I really do have fun with it. I also think that I would find it fun to be able to open the basket drawers where I keep my fabric, instead of them being all stuffed to the gills. My DS heard that I was down over a hundred yards, and he ran up to my studio to see if he could tell the difference, but he couldn’t. Yeah. So there must be a lot more hundreds up there. I don’t want to know, but I do want to keep destashing. 100 yds. in 2013. So those are my modest goals for the new year. I look forward to reading about yours and watching your progress. Good luck to us all! Linking up with Gettinhttp://www.patchworktimes.com/2012/12/31/january-2013-getting-it-done/?utm_source=feedburner&utm_medium=feed&utm_campaign=Feed%3A+PatchworkTimes+%28Patchwork+Times+by+Judy+Laquidara%29g It Done on Patchwork Times. Categories: Finishes | Tags: 2013, destashing, Evening in the Garden, goals, modern quilting, quilt of valor, stash, stash reduction, Valerie Root | Permalink. Final Stash Report of 2012! I love my numbers! I love that I’ve largely stopped buying and am really using from my stash. My numbers are so positive, I considered checking out the sales and stocking up (a little! ), but I decided against it. I do love a sale, but I have plenty. I know I’ll buy more in the new year, but hopefully that will be mainly to complete projects. They will have sales next year, too. Net stash used in 2012: -124.5 yards! How are you doing? Do you have goals for the new year? I think I know mine, but I’ll share next week. See more Stash Reports at Patchwork Times. Categories: Uncategorized | Tags: Evening in the Garden, fabric, modern quilt, quilting, stash reduction, Stash Report, Sunday Stash, Valerie Root | Permalink. It’s that time to look back over the year in quilting and think about what was made and what was learned. In 2012, I began selling on Etsy. I’ve made 27 sales so far. (I also sell on Artfire, but I’ll be ending that. I did sell in a shop here locally, which was an interesting, if not lucrative, experience. I stopped that this summer, but kept up the friendships I made there.) I’m paying for all my fabric and supplies, and showing a profit, so I can’t complain. I’ve learned about postal rates and customs forms. Most importantly, I’ve “met” so many nice people, and found homes for my work all over the country and around the world. I know they’ve gone to new babies, sick friends, nursing home patients, and favorite relatives, and to brighten people’s homes and offices. I like that. In 2012, I got involved with quilters/bloggers/podcasters on Twitter, and I’ve really enjoyed it. We’ve shared Sew-Ins and holiday preparations and pets and weather and new additions and illness and our quilt successes and questions, etc., etc., etc. Mostly it’s just a lot of nonsense and love, and it never fails to bring a smile to my face, if not an outright laugh. So fun to have friends around the country, and a few across the world. If you’re looking for me there, I’m @scooquilt. And in 2012, I started this blog. This is really pretty “out there” for me, but I dove in and did it anyway, and I’m glad I did. This is my 40th post! I’ve learned a lot from it, and had a lot of encouragement from nice people. I haven’t begun to meet my goals with it, but it’s a start. It’s helped me destash 100+ yards of fabric, and pushed me a bit to finish projects and keep working. I refuse to be a slave to it, but a little structure is a good thing. I like being part of the wonderful quilting community. So that’s what I can recall of my quilt life this year. How was your year? Categories: Finishes | Tags: Evening in the Garden, modern quilt, review, stash reduction, Valerie Root, year end | Permalink. I’ve spent a lot of today participating in the Boxing Day Sew-In on Twitter with the quilty folks. If you’re looking for me on Twitter, I’m @scooquilt. Follow the conversation at #BDSI . We’ve watched the weather advance across the country, done a minimum of cooking, and cheered each other on as we’ve made progress on our goals. All in all, a very pleasant day, and it’s not over yet. I cut out fabric for ten donation pillowcases. I already sent two off for the Sandy Hook kids. 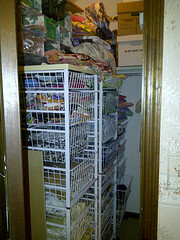 I have an email in to the Quilter’s Corner in New Milford, CT to see if they still need more. If these aren’t needed there, I’ll donate them to ConKerr Cancer as I did last year. So far I have these three cases finished. I’d love to finish the rest before I quit today, but we shall see. While I was at it, I took all the bright, novelty fabric that was too small for even pillowcase cuffs and cut it into blocks so that I can piece some kind of donation quilts soon. I have them neatly in zippered plastic bags awaiting time and/or inspiration. Hope everyone is staying warm and safe, and that you are able to sew peacefully. Categories: Donations, Uncategorized | Tags: Evening in the Garden, modern quilt, pillowcases, quilting, Sandy Hook, Valerie Root, WIP | Permalink. Just a little sewing this week, but you know how that is. College son is home, gatherings are happening, and gifts are asking to be wrapped. I used two yards of juvenile fabric on the pillowcases for Sandy Hook kids, so that helps the cause. Other than that, I’ve just been fooling around with the beginnings of some pink and gray donation blocks. This week: +0 yds., -2 yds. YTD: =116 yds., -230.5 yds. Net stash used in 2012: 114.5 yds. Enjoy your holiday, sewing or not. See more Stash Reports at Judy’s Patchwork Times. Those of you who chat about quilting with me on Twitter (don’t we have fun?) know about my recent heart palpitations over a Christmas quilt I sold on Etsy that took its own sweet time reaching the new owner, along with unconcerned Postal workers and broken tracking. It all came out fine. The new owner (very pleasant to work with) proclaims it, “one of the most gorgeous Christmas quilts I have seen.” Nice, hmm? Alas, it was not always so, and I want to share its journey from UFO to beauty. This really begins several (five?) years ago, when I became intrigued with using blue and white squares to reproduce a gingham pattern. The result was successful, if a little boring. I jazzed it up with some peacock feather borders and a flat white piping, then quilted it with lovely feathers. The batting stayed flat and unshrunken (I really think it was Hobbs Heirloom Cotton- could that be? ), so the feathers never plumped. I still think it would have been effective in the right nursery, but it’s never sold. It will be heading for Project Linus soon. Next, I thought, Christmas plaid! Yes, this could be made with 2 1/2 squares in red, green, and white. Here is what I got. Yeah. Plaid. And it just kind of sits there, doesn’t it? So it kind of sat in my sewing studio for a couple of years. This doesn’t seem odd to some of you (you know who you are!) who have oodles of UFOs, but I have hardly any. At that time, this was the only one. Now I have two, I think. So, yeah, I really had no idea what to do with this bit of Christmas ickiness. Eventually, I took it back out and dove into it. I pulled out all my stash Christmas fabric. I made borders from gold braid prints and tassel prints. Better, but still small and square. I created diamond (on point) blocks with varying shades of gold on dark backgrounds, and put rows of these on the top and bottom of the quilt. Better. A rectangle now. Now I cut large borders of printed swags and tassels. I didn’t have quite enough so I added corner stones. These brought it to its final size (47″ x 65″) and Victorian glory. I added lots of quilting in gold metalic thread. I knew it was either a masterpiece or a gawd-awful hodgepodge of Christmas fabric, but at least it was a finished quilt. It was festive and warm. Apparently, it is attractive, because it was picked up in several Etsy treasuries after I listed it last month, and favorited by many, and then purchased by this nice appreciative lady who was giving it as a gift before the holiday. I am so glad it will have a loving home for Christmas, happy it turned out okay, and so happy to have it out of my sewing space! Yes, Jaye, it is the process. Some just take longer than others. Categories: Finishes | Tags: christmas, christmas quilt, Evening in the Garden, gingham, plaid, Valerie Root | Permalink. First, of course, we have to acknowledge that our hearts and thoughts have been in Newtown, CT these past few days. As a retired teacher (and mother), I could visualize every bit of it, and it was really tough. My DH is a retired teacher and a current first responder, so we’ve been thinking a lot. We drilled for something like this. Where I worked, we sometimes had emergencies, but they never turned tragic. I know exactly what it’s like to gather children against the coat cubbies in a locked room and read to them while listening for unknown danger in the hallway. It’s what teachers do, but they’re supposed to go home again afterward, and so are the children. So many people in our quilt blogging and Twitter community have shared so much recently, and we all know each other a little better. Thank you. In all the terribleness, it is good to see people come together and to see all the gifts that have been given to these people from around the country. I stitched some pillow cases today and mailed them off for the surviving Sandy Hook children. It felt peaceful and constructive to work on them. Then I stood with the Christmas package mailers in the Post Office of our small, friendly, quiet town to mail them. Here is info on the project from Jaye’s Artquiltmaker blog. This is the tutorial from Mama Spark I use for making pillowcases, but I discovered that I have learned how to do them without looking back at the site. Lily’s Quilts: Do you follow Lynne, from Lily’s Quilts? I really like her recent post about straight line quilting. Besides the chance to see some of her great quilts again, she gives really good ideas about the quilting. I especially like the part about not ripping out small baubles and The Waltons. Kind of the running horse thing. Pattern on pattern: So, we are lovers of pattern and we often use various designs together. We do this well, we hope. Not like this motel room I encountered on my Texas trip (I think this was in Louisiana). I was stunned when I opened the door. My camera came out before the suitcase went in. It was nice and clean, but I couldn’t have stayed more than one night. Ooooh. Map: While I’m at it, here is a map I made of our Texas travels. Thanks to Diane and others for following along and keeping me company on that long journey. We had a very nice time, but those are a lot of miles. And miles. Chex Mix: I didn’t get much reaction when I posted this picture of the cereal aisle in my local grocery store, but I think it’s pretty funny. This is the America I want to think about at this time of year. Categories: Uncategorized | Tags: Evening in the Garden, pillow cases, Texas, Valerie Root | Permalink.